Kinshachi Imperial Stout, also known as Kinshachi Imperial Chocolate Stout, is an 8.5% Russian Imperial Stout brewed for those cold winter months to snuggle up next too. There are two labels: the one below with the rather intimidating lady on the front (help me history readers!) and a special Valentine’s Day labelled one. It contains a lot of chocolate malt in the mix so it’s well primed to take on the drunken Valentine’s market. I don’t have a Valentine’s this year except my mum who’ll probably send me a card but we all got that right growing up. Right? No… Oh. Anyway, the lady on the front can be mine. Kinshachi Imperial Stout didn’t explode out of the bottle even though the picture above would say otherwise. It was lively though as I could barely get half of the bottle in. The head did settle down to a brownish white colour and was much more compact at perhaps one, maybe two, fingers. Get your nose in the glass but be warned, it’s potent. Kinshachi Imperial Stout had a tremendous aroma of a bitter chocolate coffee with something verging on liquorice. When I say verging it’s because it wasn’t as strong as the original aromas. This is an imperial stout that really is not for the faint of heart. Heck, drinking Kinshachi Imperial Stout will damage your taste buds for the evening and other beers or champagne. The potent bitter chocolate coffee nuance found a friend with some smoky toffee flavour too that finished off with the liquorice kick in the aftertaste. Kinshachi Imperial Stout, perhaps as an homage to its country of leaning, had an oily texture to it as well, a sticky taste that I could taste the next day. Even after brushing my teeth. And using mouthwash. Kinshachi Imperial Stout is, without doubt, a very good example of an imperial stout done right in Japan though the potency of the taste will take a lot of getting used to. 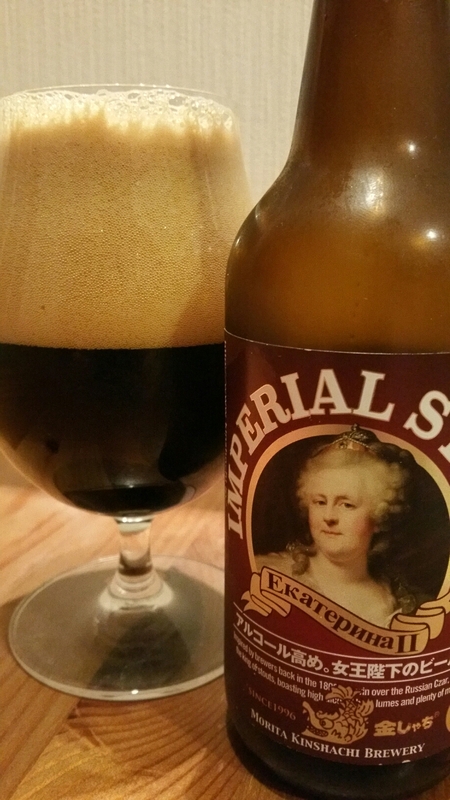 Kinshachi Imperial Stout can be bought from the Morita Kinshachi online store here. BeerTengoku picked up a bottle of this elixir from GoodBeer here and it was in stock at the time of writing. Unfortunately, we haven’t seen it on sale in our usual haunts.